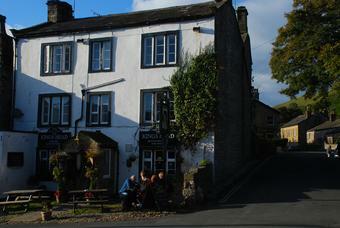 The King's Head is situated in the fairly touristy village of Kettlewell, which has plenty to attract you here. The pub itself felt a little commercialised and there is a clear focus on food. Nevertheless, the interior does maintain a nice character. There are a few tables outside at the front. Ales were Dark Horse Hetton Pale, Wharfedale Blonde & Tetleys Cask. Another gastro pub - how many does one village need? More space to sit than at the racehorses and the chance to try Dark Horse - previously unseen. Nowhere to sit in the evening if not eating. Just a few stools at the bar. Two pints, a small Gin and Tonic and a small white wine £17! Pub has reopened but aiming firmly at the gastropub market. Not really any space inside for anyone wanting a drink but not food.